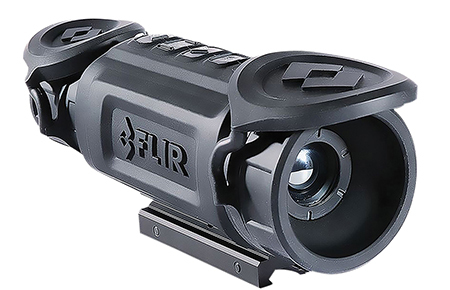 Compact and easy-to-use, the Flir ThermoSight R-Series delivers rock-solid thermal imaging for seeing predators and varmints in zero light. The scope contains advanced image correction technology that optimizes images automatically. Along with fixed lens options of 13mm, 19mm, 35mm and 60mm, the R-Series provides three inches of eye relief, up to 16x digital zoom and multiple reticle options, with a repeatable and dependable zero. User can select between white hot, black hot, and InstaAlert palettes. The ThermoSight R-Series has an internal shock reduction system(SRS-M) that is qualified for a MSR semi-automatic platform, up to .30 caliber. The durable, water-resistant casing can be submerged in up to three feet of water. All models feature video out, except RS24. These scopes come with 2 years standard warranty, 3 years (with registration), and 10 years(thermal sensor only).